The studio of Japanese photographer Kimbei Kusakabe (日下部金兵衛, 1841-1934) on No. 7 Honcho in Yokohama, Kanagawa Prefecture. Kusakabe worked with famed photographers Felice Beato and Baron Raimund von Stillfried before opening his own business in 1881 (Meiji 14). 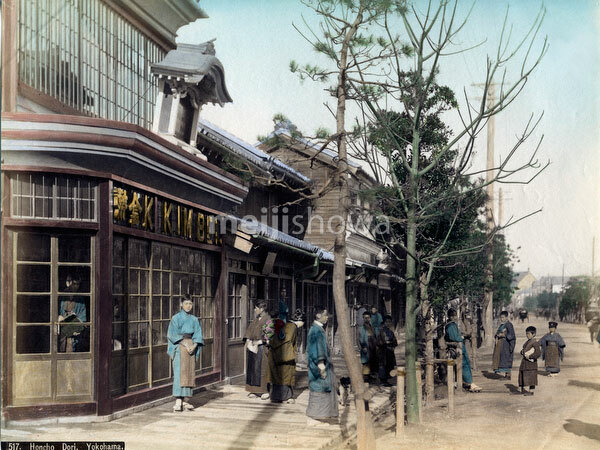 His studio was in Bentendori before he moved it to this location in Honcho in 1889 (Meiji 22). Kusakabe also owned a branch in Ginza, Tokyo.